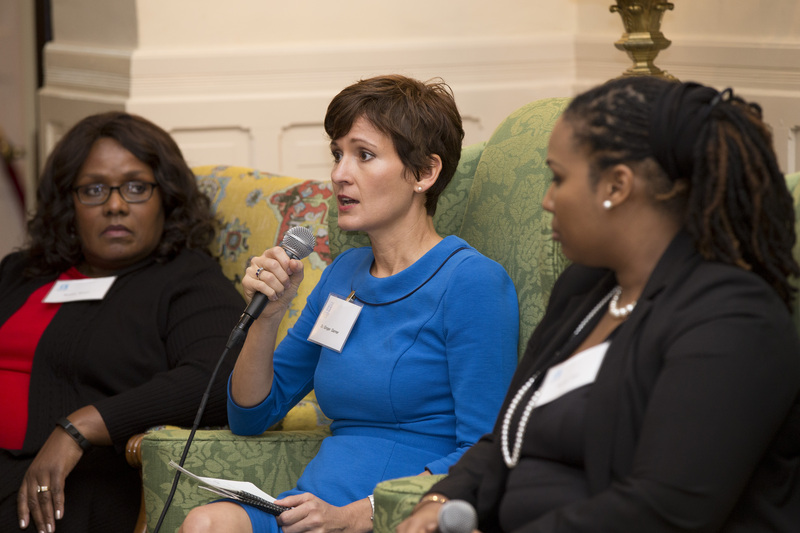 On November 8th I was invited to speak at the North Carolina Executive Mansion as part of a panel for the NC Chapter of the UN Women. What an amazing experience it was, and an honor and privilege to be able to sit on a panel with so many qualified women. In fact, every woman in attendance that was incredibly accomplished, from the school-aged girls that traveled from Winston Salem to the most senior members of the organization. The reality is, while I was there to inspire other women and girls with stories of advocacy and experience in my career, I was the one being inspired. I was inspired and uplifted by the women and men in attendance, including a surprise visit from Governor Roy Cooper. Each of them had their own story to share, and it gave me great hope and faith in this truth: When we work together, and when women support women, and men support women, we can make great strides toward the equality we have so long struggled for. While I don’t have a video of the entire experience, short clips of my responses to the following questions asked of the panel are included below as well as most of my complete responses to the questions. How have you helped women and girls claim their power? I was born to a teenage mother. While my upbringing shaped me to understand the “have nots” of life, it also gave me the motivation to go above and beyond not only for myself but as an advocate for others. My upbringing also granted me a finely tuned radar for injustice. I’ve helped empower women by giving my time to causes in Haiti and Afghanistan, through my position on the board of the Carteret County Domestic Violence Program. I’ve presented research at the World Congress in South Africa about the global maternal health crisis. I’ve shared my story in living the values I believe in and mentoring young women to do the same. I’ve ultimately discovered that policy issues lie at the heart of the problems I’ve seen in healthcare, particularly as they affect women. How can we combat negativity in media/online? There are two major ways to combat the negativity we are bombarded with today. The first of those is communication. It’s up to us to combat the millions that are spent on ads targeting young people. The advertising that young men and women consume stands to affect the perception, treatment, and role of women in society and our responsibility in empowering women is to make sure we speak we our money in supporting female-positive businesses and advertising. That brings me to the second major effort in combating negativity towards women: economic policies, both formally and informally. Money in the hands of women elevates women’s causes and women’s voices. The same goes for the effect women have in leadership roles. Not only does that allow them to act as role models and mentors for young women but formal policies and quotas for women in positions of power ensure that their influence is heard. It’s on women like myself who find themselves in a position to do so to fight for equality. To end violence against women. To create leadership opportunities for girls. Or maybe to run for office! Governments employing only men are governments pushing taxation without representation. Why is there generally a hesitation to use “women” and “power” in an affirmative sentence? What social constructs is this hesitation derived from? This issue has both an anthropological and historical context. Social norms and cultural conditioning target society to defer to men. Religion can often be weaponized against women – to be “submissive, defiant, humble, follower.” It doesn’t have to be, as I am a practicing Methodist & Christian, but so often, especially in the hands of men, religion becomes weaponized against women to marginalize and control them. Arguably the most powerful social construct is that the definition of what it means to work and what it means to be creative are masculine — derived from the dominator, patriarchal model. We must demand that our story must be heard — currently women are mostly absent in history or unheard at best. We must also shift relationship models in all aspects of life to partnership models. Currently in relations between genders, traditionally feminine characteristics are not valued and the feminine work of caregiving is not valued. In society today, traditions of violence are justified and even glorified as in the act of war. Social and economic structures value an authoritarian in a family and in a state. We can do a great deal to improve this by valuing caregiving professions like teaching, therapy, and nursing as a few examples of many professions traditionally worked by women. Those professions are consistently and persistently underpaid and undervalued. As my mentor Dr. Riane Eisler and social scientist says, why does a plumber get paid $250 to come and look at your toilet to determine what needs to be fixed, but an early childhood education teacher nurturing the minds and souls of our next generation makes minimum wage and can’t even afford rent? Additionally we need to start valuing what are thought of traditionally as “feminize characteristics” like nurturing and compassionate relationship and caregiving, because it isn’t the masculine warmongering that sustains the world, it is the lifegiving nurturing and caregiving that women provide which will ensure our future. How can we change social constructs to classify women as valuable? We need true democratic values, mutual respect and equality, and to value caregiving. We must shift from nurturing a dominator model of communication to nurturing a partnership model. We also have to fight to end inequality for women in healthcare and the research shaping healthcare. Being a woman is not a preexisting condition. Currently, though, gender is a healthcare equity determinant. As women, we will be poorer and receive poorer care. That starts with improving maternal care and healthcare policies. Prosperity of our nation and of our society depends on the well being of our mothers. See gallery and video clips below.